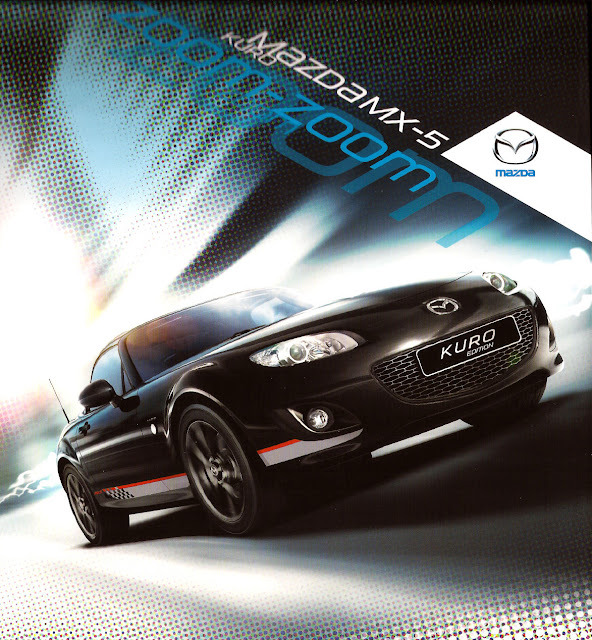 The MX-5 Kuro was a 2012 special edition available in the UK. 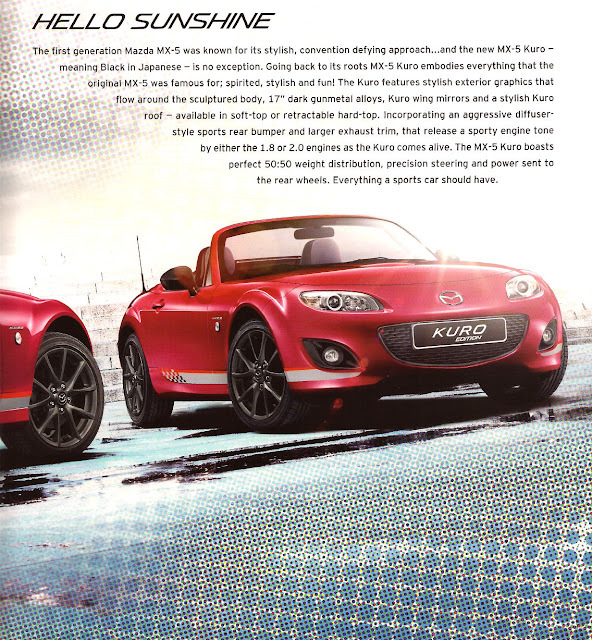 Kuro means 'black' in Japanese so it's no surprise to find this model of MX-5 features black exterior highlights. 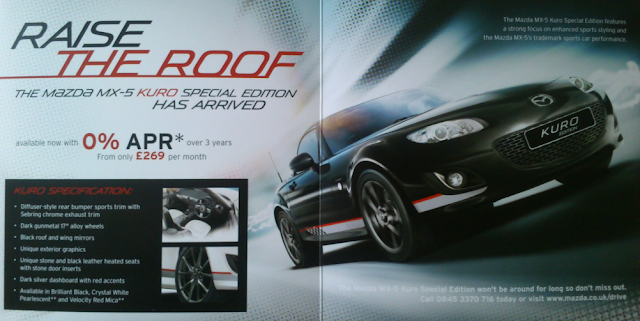 The roadster coupe version has the same black retractable hardtop previously seen on the earlier Sport Black. 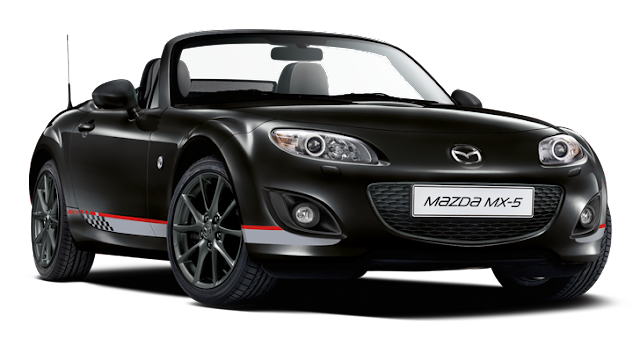 Kuro was available as both soft top and coupe and each version gets black painted mirrors and very stylish dark gunmetal 17" alloy wheels. These darkened wheels are reminiscent of the 2004 Euphonic model from the previous generation. The exterior changes were intended to reflect Mazda's motorsport aspirations and give the car a much more purposeful look. 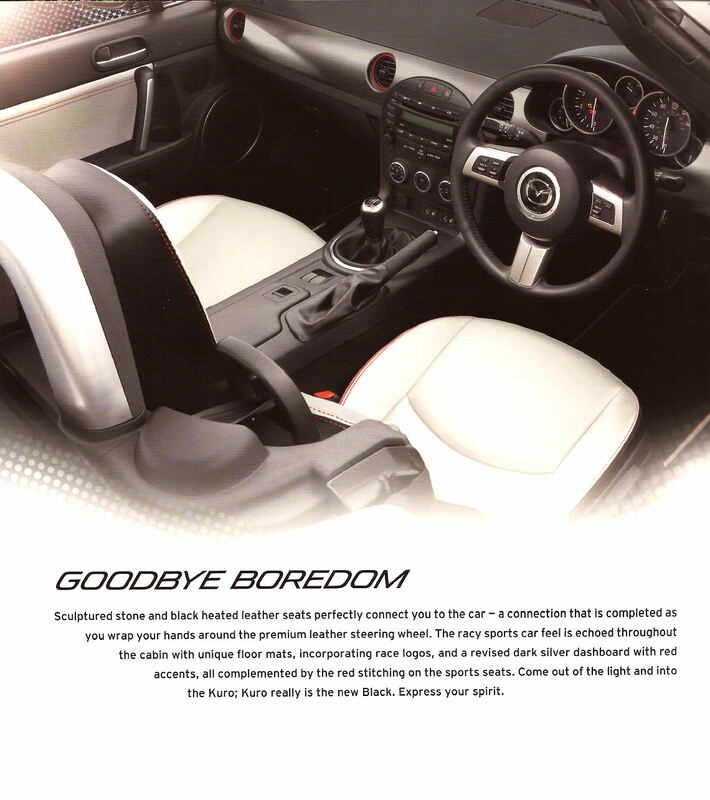 Kuro's exterior benefits from a couple of optional extras included as standard. 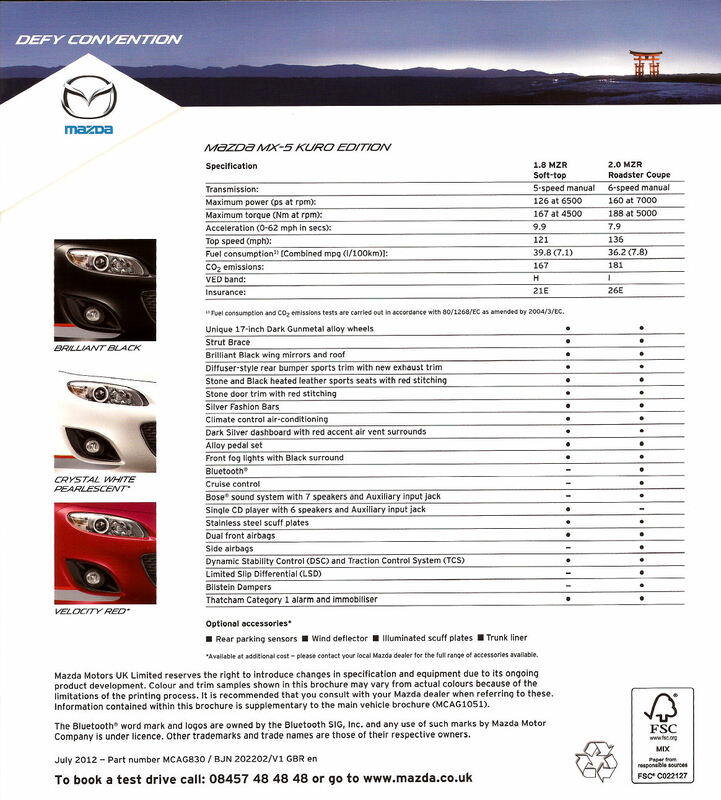 The rear diffuser trim piece that fits to the underside of the rear bumper and some unique red & grey graphic stripes along the lower sides and front bumper corners are standard equipment. The exhaust tailpipes are given a larger chrome trim by Sebring. 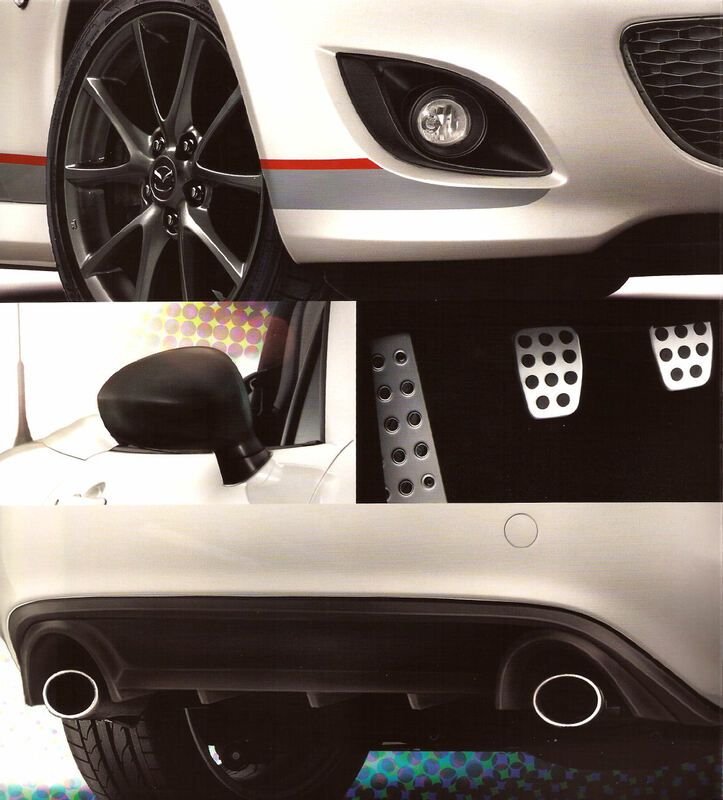 The front grille has black trim as do the foglight surrounds. A chrome "Kuro" badge finishes off the exterior nicely. Inside we find the interior has red contrast stitching on the stone and black leather heated seats, red accents to the air vents, some uniquely badged floor mats and the optional alloy pedal covers as a finishing touch. 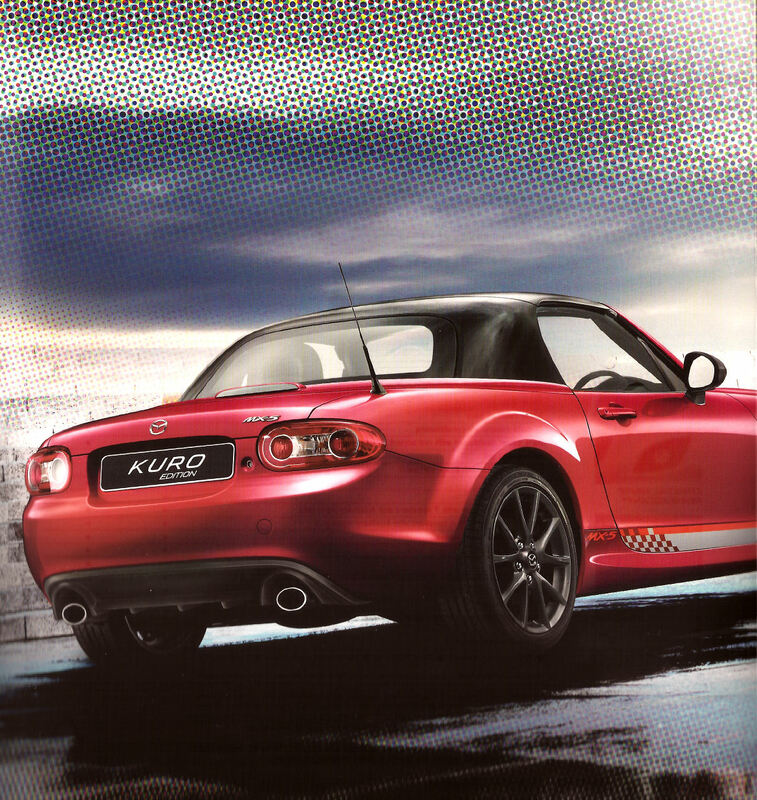 Performance wise nothing has changed, the Kuro was based on the 1.8 SE and 2.0 Sport Tech, priced at £18,495 and £21,995 respectively. The Kuro was available in Brilliant Black, Velocity Red Mica, or Crystal White Pearl Mica (also known as Crystal White Pearlescent). Only 600 Kuro editions will be available in the UK, that's 200 soft tops and 400 RHT coupes. The colour distribution was said to be 40 black, 60 red, and 100 white for the soft top; and 80 black, 120 red, 200 white for the coupe version.